Ferrari drivers Fernando Alonso, left, and Felipe Massa, right, flank team principal Stefano Domenicali on Thursday. 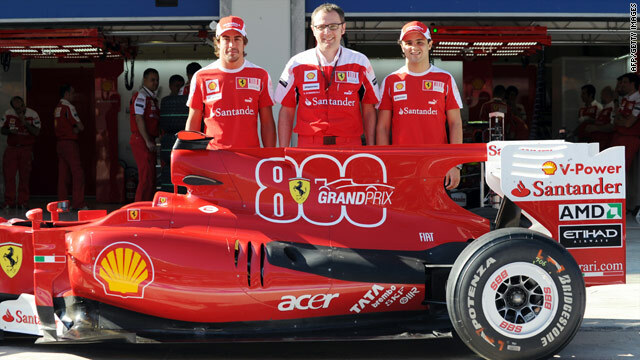 (CNN) -- Legendary Formula One team Ferrari will celebrate its 800th Grands Prix in Turkey this weekend. The oldest surviving outfit in motorsport's elite class since starting out in 1948, the Italian marque will parade special logos on the vehicles of drivers Fernando Alonso and Felipe Massa. "Eight-hundred Formula One Grands Prix represents a milestone in the life of Ferrari, which fills us with satisfaction and pride," chairman Luca di Montezemolo told the official Formula One Web site. "I want to share our delight in this achievement with all the drivers who have driven our cars in the world championship, and with our fans. It is nice to look back and see what we have done together, aware we are part of a story that is without equal and is ongoing." Blog: Is America interested in Formula One? The 62-year-old has been involved in 359 races since joining Ferrari as sporting director in 1973. He has seen Ferrari set a record of 15 drivers' championships, 16 constructors' titles, 211 race victories, 632 podium finishes, 203 pole positions and 221 fastest race laps. Ferrari also holds the record for most consecutive race wins (14 in 1952-53) and wins in a season for one driver (13 for Michael Schumacher in 2004). The seven-time world champion German's 19 consecutive podium finishes in 2001-02 and 24 successive points placings in 2001-03 are also F1 records. Ferrari's first race victory came in 1951, the second championship season of Formula One, and its most recent was registered in March this year by Alonso on his team debut in Bahrain. Ferrari lies second behind Red Bull in the teams' standings going into the seventh race of 2010 in Istanbul as it seeks to bounce back from a disappointing 2009 season that saw Massa sidelined for the second half with a horrific head injury. Two-time world champion Alonso is third in the drivers' standings behind Red Bull's Sebastian Vettel and Mark Webber, with Brazil's Massa fifth. "It's a great pleasure for me to be a small part of these 800 Grands Prix for Ferrari," said Massa, who is seeking his fourth victory at the circuit amid speculation that he will not be retained by the team next year. "I will try my best to go to Turkey to fight for the victory, to have also a nice celebration about these 800 Grands Prix. It's a fantastic feeling to be inside this nice story." Alonso is looking forward to a long association with Ferrari following his move from Renault. "Hopefully, I can celebrate a hundred races with Ferrari! When I joined the team it seemed even better than I had expected, and I think it still has a huge potential in terms of the current car's performance, given that the facilities in Maranello are maybe the best," the Spaniard told the Ferrari Web site. "Also, the atmosphere in the team is very good, like a big family. The staff are not just workers for the team, they are part of its history."